My 40 week visit with my midwife was on Thursday 9-24, at 40 weeks 4 days. We were doing bloodwork and a 24 hour protein as I had had continued high BP since 32 weeks and we wanted to rule out pre-eclampsia. I had my midwife check me and asked her to do a membrane sweep if she could. It’s not something I normally would have asked for but with my BP so high and the potential to risk out if I was indeed pre-eclamptic and our home induction methods failed, I felt it was worth it. Initially I was found to be 1.5 CM and 90% effaced. When she went to do a stretch and sweep, a small thin band of cervix let loose and I was suddenly 4CM. She said she thought it would stay at 4CM since it stretched on it’s own. She also moved my cervix over so it was completely midline and not slightly off to the side as it had been. This wasn’t a fun feeling, let me just say. Later that night, I was crampy and was getting brown mucus on the TP but thought nothing of it because I’d had a pretty good exam and figured it was all from that. I got brown on the TP all night and most of the morning. I was feeling a lot of braxton hicks with no real timing to them so I thought nothing of it… Another day, another chiro visit, etc. I came home and unloaded the food and settled the kiddos in… Scott noticed me looking at the clock and pausing and asked me what was wrong … I originally said ‘nothing’ because I didn’t want to get him into birthing gear and have it not be time…. He said ‘no, that’s the contraction timing face’ or something along those lines. I said yes and of course got questioned with ‘how long, how far apart, you should call Joey’… I didn’t want to call her yet… It’d only been an hour and I wasn’t sure it was labor… They were just braxton hicks with cervical pressure (which I’d been having since 30 weeks). I went to lay down in the bedroom after eating, talking with a good friend on the phone who was sort of timing my contractions for me and making me laugh (OUCH) through them. I called my midwife at nearly 3pm, when the contractions had moved into a more steady 2-3 min apart pattern. She said it was a good thing I was in labor because my labs weren’t good and she was actually going to call me and suggest I start some cohoshes and try to move baby along. She suggested I get in the shower and start the cohoshes around 5-6 if things seemed to peter off… I debated starting the cohosh before getting in the shower but I’m very glad I didn’t… The shower intensified things greatly. I tried bouncing on the ball but it made things intense in a way I couldn’t manage so I stopped… In hindsight, it probably would have sped my labor up had I continued to bounce on the ball but I was not able to manage the contractions that way and a manageable labor was more important to me than a fast one. My friend Micah got here around 7 or so and we went for a walk around the neighborhood. I talked to the midwife again, let her know things had intensified and she said she was going to go home and put her kids to bed and then head up. Around 8:30/9pm I called her back because I was getting to the ‘unable to talk during’ contractions and I really wanted to get in the birth pool. She was concerned the water would stall my labor but said to get in and if I felt labor stalling to get back out. The water, just like the shower, intensified things but it was very manageable. Hydrotherapy really works! My contractions spaced a bit and did take a weird pattern but were lasting 2 plus min so I continued to stay in the pool and work through each contraction as it came. My husband was very aware of how I wanted to birth and lit several candles and kept the room dark and quiet. I laughed., joked and talked through much of my labor… sipping on lemonaid viatmin water and trying to eat watermelon between contractions. I started to get a little panicky just after 11pm.. I blurted out ‘Joey isn’t going to make it’ which freaked my husband out. I then started to feel the urge to push… Micah said ‘you don’t sound like women do when they get the urge to push’ and as soon as she finished that statement, I let out a huge pushy grunt that was completely beyond my control. Micah called Joey for an ETA and let her know that I was getting pushy. They were still 30 min away so Micah cut the legs off her yoga pants to turn them into shorts, in case she needed to jump in and help me birth the baby. The midwife, doula/birth assistant in training and the birth assistant walked in the door at 11:30, moments after my bag of waters exploded. It was like a torpedo through the water, it broke with such gusto. I looked back at Micah and Scott and asked ‘what the heck was that? !’… They came in, started to get set up and kind of watched and waited a bit. I felt more urges to push and so I asked for a cervical check because my fear was that I would not be far enough dilated for pushing and I didn’t want to push against an undilated cervix. With Bella, I felt the urge to push at 6CM and was told not to push, to fight it. There was no fighting this but I wanted to be sure, for my own peace of mind. I was found to be complete with baby at 0 station…. I settled into a semi-recline position, balanced on my husbands legs. It took me a bit to get the hang of pushing and how it felt… It was an incredibly intense, uncontrollable feeling I was unprepared for and I think I was afraid. My coping mechanism during pushing was saying I couldn’t do it, lol. Picture a hugely pregnant woman saying loudly ‘I can’t do this!’ as she’s pushing along with her body. It was a bit comical, I’m sure. I remember telling DH it was his turn to push for a while and he responded with ‘OK, I’ll do the next one’… to which I whacked him (playfully) upside the head. The doula and birth assistant were wonderful during this time, giving me sips of drink and putting cool rags on my head. During the pushing stage, Scott, who had been up since 11pm Thursday night (it was now midnight Friday night/Saturday morning) started to have a panic attack. I kept telling him to get out of the pool before he passed out but he wouldn’t get out. The doula fed him some gatorade and wiped his face down with a cool rag and gave him an ice pack to cool down. He worked through it because he knew he couldn’t leave me… He knew I needed him that much. He put forth a lot of effort physically to help me through pushing. As the baby crowned, I reached down and felt the head… I rubbed the head, touching the soft hair. It was inspiring for me to know that yes, this baby is right there and no one is going to take it from me like they did with Bella! As we waited for his shoulders to be born, my midwife checked to make sure the cord wasn’t wrapped around his neck. I pushed out his shoulders. My midwife said ‘Felicia, reach down and pull out your baby’ and I tried but couldn’t reach around my still huge belly to get him. I kind of panicked because I couldn’t reach the baby. My husband lifted me up more so I could reach and my midwife helped guide him to my chest. The most euphoric feeling is catching your own baby… I think especially in a VBAC or in my case, a VBAMC. He didn’t cry, in fact his eyes were closed. It kind of scared me that he wasn’t OK but he was pinking up so they assured me he was fine. I counted his toes and fingers and checked to see what we had been blessed with… A boy! A bit surprised as I had felt girl for a while, up until the end. I called my mom at 12:45, just 15 min after he was born, while we were still sitting in the birth pool. She came right over and was a bit upset I didn’t call. I meant to call after my water broke but I was so far into laborland that I thought it but didn’t speak it. I woke Caleb when I yelled during my final push and so he came in to meet the baby… He was a little shy at first with so many people there but he warmed up quickly to his new baby brother. 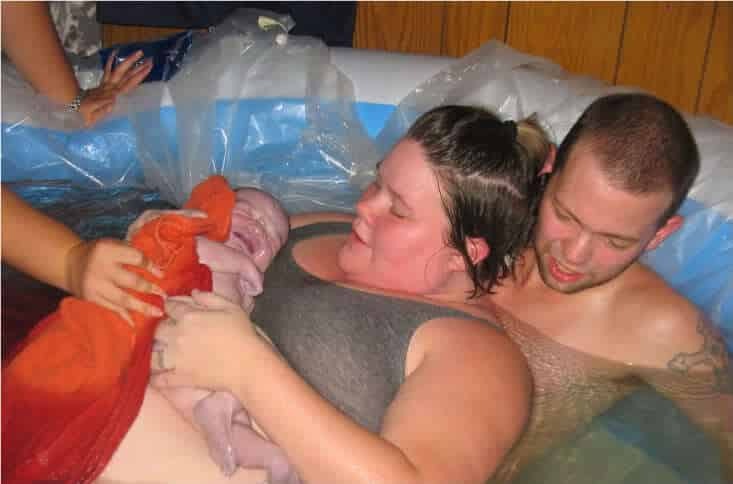 Shortly after, we cut the cord and I got out of the pool to deliver the placenta. I did bleed a lot and needed a shot of pitocin. The baby was weighed and measured. 8lbs 1 oz and 21 inches long… with a 14 1/4 inch head… They really wanted me to go to the bathroom but I couldn’t…. It took me a bit to convince them I’d be OK even though I hadn’t pee’d for them. I snuggled up into my bed with my new baby on my chest and just nursed him all night… Caleb came charging in the bedroom around 6am wanting to see the baby… Bella trailed behind him and saw the baby, gave him a kiss and then ran away to play. I felt bruised and sore but it was an amazing feeling knowing that it was all worth pushing that baby out, in my home, in my bedroom, the way I wanted it. Jameson was born via VBA2C at home on September 25th, 2010. He came 5 days after his due date and the day we found out I did have pre-eclampsia. He was my largest baby at 8lbs 1 oz, 21 inches long and 14 1/4 inch head.